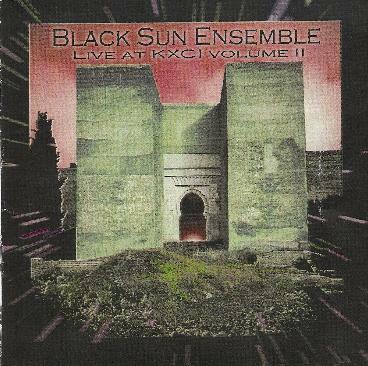 Black Sun Ensemble - "Live at KXCI Volume II"
This live recorded sequel to the first volume features the same blistering line-up but finds the group inhabiting an altogether different space, including performances of more traditional raga-inspired pieces and some feverish modal exercises. A number of classic Black Sun Ensemble songs are well represented, with particularly excellent versions of "Dove of the Desert" and "Cherokee Mist." Jesus Acedo is clearly the instrumental fire power that drives BSE, though stellar performances are turned in by Eric Johnson on bass, banjo and percussion; Brian Maloney on tenor sax; and John Paul Marchand on an assortment of percussive instruments. Here Acedo plays sitar-guitar in his own uniquely self-realized style, though some obvious comparisons can be made to "Kashmir"-era Zeppelin, the early Mahavishnu Orchestra, as well as to both Hendrix and Santana. Alternately meditative and fiery, pieces like "Lilith" and "Dove of the Desert" amply illustrate Acedo's considerable talents and an ability to make his axe both sing and shred, sometimes within the same measure. There are times though when Acedo indulges himself too much, producing nothing more than self-absorbed guitar tangents that verge on the histrionic; fortunately, however, Maloney's plaintive tenor sax effectively counterpoints Acedo's leads and usually brings them back down to earth before they spiral out into infinity. This is especially the case on "Lilith," which manages to frame Acedo's middle-eastern interventions with a beautiful jazz-fusion patina that recalls McLaughlin and Santana at their most mystical and devotional. "Dove of the Desert," the disc's concluding track, is archetypal Black Sun Ensemble, with Acedo's guitar burning through the scales like a phoenix rising from its pyre. As the molten feedback cools, we're brought back down to terra firma with the chiming reverence of sacred tones that drift into the silence like desert nightwinds on a mesa. Executed with both subtlety and sincerity, Live at KXCI, Volume II, will no doubt appease fans of intelligent, if sometimes indulgent, fusion music. Visit the SlowBurn Records web site at: http://www.slowburnrecords.com. Contact via snail mail c/o SlowBurn Records; PO Box 241; Tucson, AZ 85702.